Non-food shopping trips were up 1.2% in October, boosted by good weather and signs of recovery in the job market. 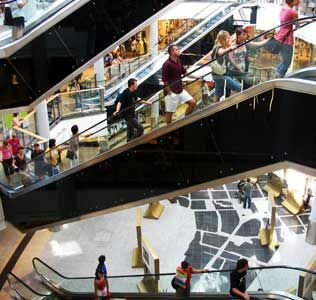 Synovate's latest Retail Traffic Index reported that year-on-year shopper footfall was up again in October - the third rise in the last four months. The index recorded a 1.2% rise in non-food shopping trips in October compared with the same month last year. Month-on-month figures were slightly down at -0.3% for October versus September, however, Synovate believes this reflects "normal seasonal variations". Synpvate's Dr Tim Denison said: "This is the first month of 2009 where improvements at a national level were sustained for every week of the month...It certainly seems that consumers in the final quarter of the year are re-engaging their love of Britain's greatest free-to-visit indoor activity." The long spell of mild weather played a big part in the revival, along with the recent boost in consumer confidence as a result of house price rises. The Recruitment and Employment Confederation (REC) also reported a recovery in the UK job market with sharper rise in both permanent and temporary placements in October. In fact, the latest increase in permanent positions is the fastest rate rise in two years. REC chief executive Kevin Green commented: "These figures show that the UK jobs market is on the road to recovery, with signs of improvement for the third month in a row. The demand for permanent recruitment is returning as employers start to hire people at an accelerating rate." He added that confidence is on the rise in the UK and that previous predictions of a three million peak in unemployment by 2010 will not be reached. Meanwhile, Dr Denison explained that retailers should look forward to a bright Christmas. Until now consumers have prioritised paying off debt instead of spending. However, Synovate's latest figures have indicated that households could now be more receptive to spending at least some of their disposable income - especially when tempted by "the great value deals that savvy retailers have been laying in their paths". He said: "The outlook for Christmas remains solid, even bright, as predicted last month. Retailers are in a more comfortable position than they were this time last year, when they were resigned to having far heavier stock levels than they would have liked. This year will not be a 'throw-away' Christmas and shoppers would be well advised to buy when they see bargains and not expect prices to keep being cut as they were last year."